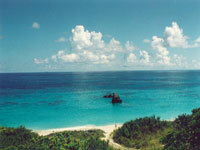 Whether sunbathing, swimming, or entertaining the kids, there is a beach in Bermuda for all-comers. The sweeping half-moon of Horseshoe Bay is recognised as one of the world's finest beaches. Wawrick Long Bay, on the east fringe of South Shore Park coastal reserve, is a wonderful stretch of pink and white coral sands, great for snorkeling. West Whale Bay welcomes Humpback Whales in April and rewards visitors with spectacular sunsets. There are summer bonfire and music nights on Tobacco Bay Beach, also a haven for marine life. Church Bay and Clarence Cove both offer safe swimming and snorkeling year round, while those seeking a bit of peace and quiet can head to the tiny but stunning Jobson's Cove.